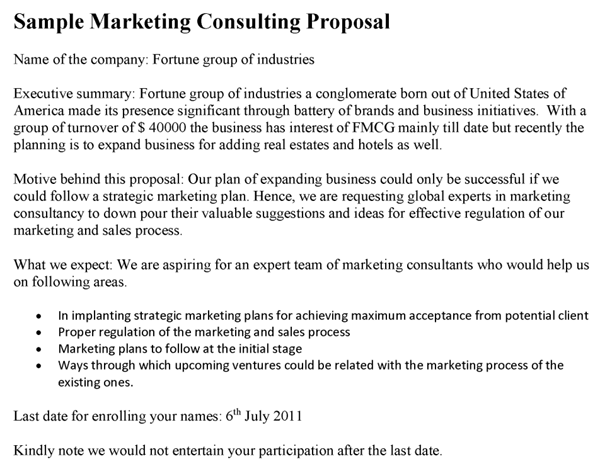 A marketing consultant proposal is a document drafted to offer consulting suggestions for marketing services to a particular business. Thus, the marketing consulting proposal provides the prospective client a preview of solutions that you (the marketing consultant) will provide in response to issues they may be facing regarding marketing. The proposal is developed by the marketing firm, outlining solutions the marketing consultant has in response to the prospective client's needs. Whether the potential client approached the marketing consultant or vice versa, it is up to the marketing consultant to research the prospective client profoundly and thus, draft a proposal that will win the potential client's confidence and thus enter into a business relationship. The goal of the marketing consultant proposal is to help the prospective client determine if the marketing consultant has the best solutions for solving the marketing issues of the company. Businesses tend to ask for numerous proposals from different consultants before settling on one particular marketing consultant, and thus, if you are to stand out, you need to conduct in-depth research on what the prospective client needs, and also to determine that your marketing consultancy can provide the best solutions at the most competitive market rates. Whether you choose to draft the marketing consultant proposal from scratch or a template, here are a few things to keep in mind. While you may need to showcase your consultancy skills and (hopefully) win the business, this approach often backfires. If you are writing the marketing consultancy proposal, it means that you are a skilled marketing consultant already. The urge to moonlight on your strengths as a marketing consultant should be ignored. The prospective client doesn't need to know how good you are (they expect that already). They want to see what you can do for them. Thus, the marketing proposal should primarily focus on the client instead. If you are going into details as to how well equipped you are, it should be to address a particular need that you know will be handled by your skills. Therefore, when drafting the executive summary, make sure you confirm to the prospective client that you understand their pain points and that you do have the solutions they need to address these issues. While at it, don't make the first executive summary too long. It adds no value. The marketing proposal is drafted after prior conversations have been held with the prospective client with regards to their needs in marketing consultancy. Therefore, unless very necessary, avoid adding new information – especially negative information. Make sure the content focuses on the previous discussions held with the prospective client. The marketing proposal is based on research into the prospective client. This effort is to know what unique marketing strategies they need, understanding their unique business styles and working environment as well as current plans that no longer serve them. This may seem like new information, but it's not – most likely the prospective client suspects as much as you do, but needs help getting their marketing campaigns on track. During previous conversations, most of these issues should have cropped up anyway. The problem of introducing new information is that it will lead to confusion, and confusion will lead to inaction. You don't want your prospective clients getting confused as to whether they need you or not. Keep it simple. 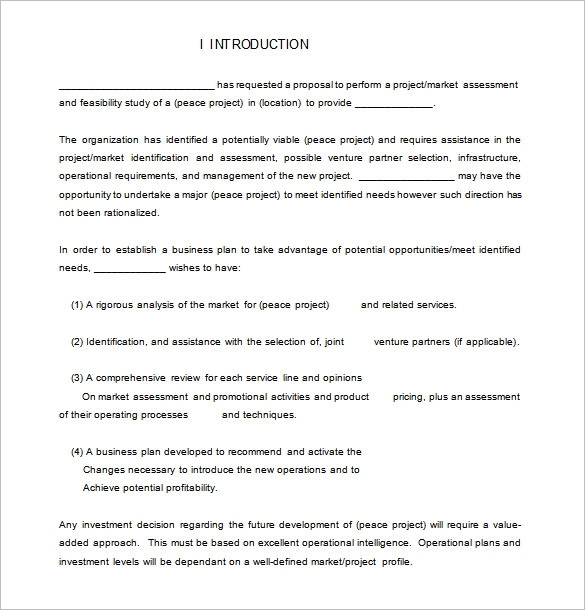 This outline isn't definite as some proposals tend to be more detailed than others. A clear flow of ideas with proper structure and a clear, concise business language is what will make your marketing consultant proposal earn the respect it deserves.